I'm fundraising for my brother Mark (Bullheart) Fradgley. Many of you will know that Mark has been fighting a rare type of cancer called angiosarcoma since 2009. Just before Christmas we found out that the chemotherapy Mark was receiving was not working, so a new plan was needed to enable my brother to keep on fighting this disease. Mark was given three options for treatment. Option A; a type of chemotherapy that merely maintains Mark’s current health levels, rather than reduces the sarcoma. This treatment at best aims to buy the patient a few more months, but as far as we as concerned a few months aren't enough for all of us, especially Mark's two daughters who are just 6 and 3 years old. Option B – a new clinical trial, which has had really promising results in the USA. Mark has waited almost two months for this trial to open, only to be told there is no start date and the doctors have no idea when the trial will begin. He simply does not have the time to wait, especially with no certainty about if/when the trial may even start. Realistically, this only leaves him with “Option” C – a form of chemo called Abraxane. This drug is linked to another type of chemotherapy called paclitaxel, which is a known first line sarcoma treatment. However, Mark had an allergic reaction to paclitaxel so has not been able to receive it before. Abraxane is formed in a way that prevents allergic reactions, enabling Mark to receive this really promising drug. However the anti-allergy element makes Abraxane expensive, and the NHS are refusing to fund Mark's treatment. The treatment costs £3000 per cycle. Mark will need 6 cycles in total, administered every three weeks. This is simply unaffordable for Mark and his wife, Megan, to do on their own. I am hoping that this is where you, reader, come in. Asking for any form of help, especially financial aid, is not something that comes naturally to Mark. So I am asking you on his behalf to help support them, by donating to fund the treatment he very much needs. His first cycle took place on Monday this week, thanks to his amazing in-laws. So with 5 more to go, our crowdfunding target is £15000 to cover these costs. 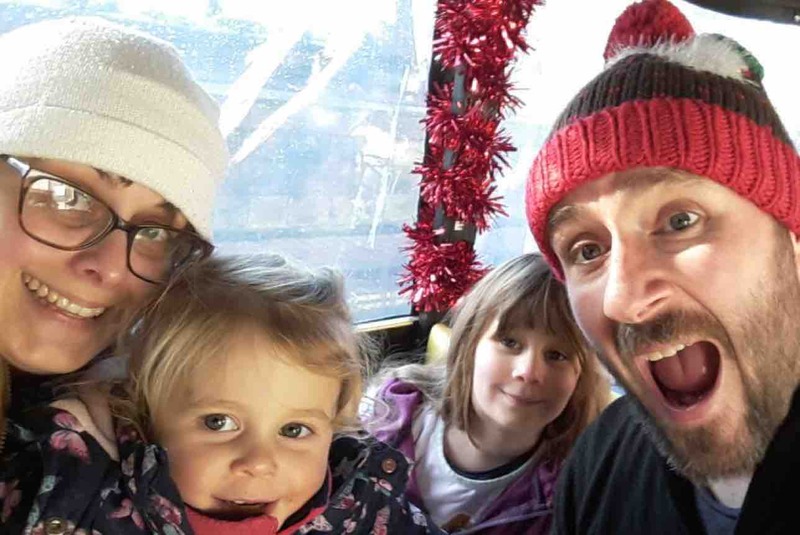 I am in awe of my big brother – his sheer resilience, his unfailing sense of humour, of how he and his wife manage their situation whilst maintaining some kind of normal family life for their girls, Seren and Gwen. I know that many of you feel the same as me. Please, please help us to smash this target if you can. Mark has now completed all 6 cycles of Abraxane. Chemo is always hard, but Mark has approached this lot of treatment with his usual stoicism and humour. Over all he has tolerated it really well, with no hospital admissions or other dramas which have happened during past treatments. The latest scan results have shown continued reduction in the tumour sites, showing that the treatment is working, slowly but surely. Because things have been going well, Mark's consultant has recommended he has a further 2 treatment cycles. Because of your incredible generosity we have been able to go ahead with these extra treatments, without having to worry about the additional costs. So Mark had his 7th cycle today, with the 8th due in another 3 weeks. After that he will be scanned again with a view to coming up with a further plan, which may include more Abraxane and/or some more targeted radiotherapy. So this update is just to say thank you again, for allowing us to continue this treatment into additional cycles without having to worry about costs. Mark and Megan have asked me to post an update. They are totally blown away by the generosity you have all shown. Thanks to these donations Mark now knows that he can complete this current chemotherapy regime without fear of running out of funds. A massive thank you is in order. A number of people have contacted us, asking as to whether the intention will be to continue to fundraise further in the future as a result. The short answer is yes, given the astonishing and remarkable response from everyone so far, we have decided to seize the moment and raise the ceiling to accommodate this. We hope to increase the total to £30k. This is on the basis that Mark's prognosis means he will inevitably need more treatment at some point in the future, so any additional funds can be put towards finding the best possible treatments moving forward. Mark and Meg have always taken one day at a time, never daring to look too far ahead. But these additional funds make it possible to start looking towards the future, and other treatments that may be needed.